You know about bounce castles in the real world and have likely enjoyed one at some point in your life (hopefully!). 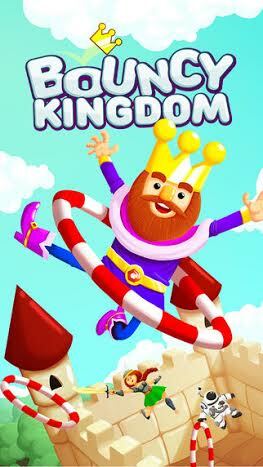 Well, Bouncy Kingdom by Kongregate brings them to another level in the app store, and it may just be the most fun-loving, casually enjoyable mobile game to come out in months. In a time when app developers seem intent mostly on creating the most realistic or innovative experiences possible—mimicking console quality to the best of their abilities and trying to build deeply immersive games—Bouncy Kingdom plays like a cartoon that’s having a little too much fun existing. So, what is it exactly? Picture a hollowed out castle with bouncy interior walls, where hula hoops appear spontaneously in mid-air. You control a tiny cartoon character (The King) bouncing around delightedly in this environment, trying to fly through all the hoops before they disappear, and avoiding obstacles (such as ghosts) as you go. If you fail to get through a hoop before it disappears (each one only stays visible for a short time), or you collide with a dangerous obstacle, your round is over. Then, you’ll need to start all over or watch an advertisement video for a chance to revive without losing your streak of hoops. That’s pretty much the whole story as far as gameplay goes, but oddly enough it’s the atmosphere in this simple experience that makes it a real winner. Well, that and the fact that you’ll be hooked after a single round and might not stop trying to beat your top score for hours. As basic as it is, I find the castle background to be unexpectedly pleasant. Medieval settings are rarer than it seems they ought to be in gaming, and when they do pop up they tend to be dark and harsh, steeped in dark fantasy or gothic atmosphere. This is a win for the cheesy castles of Disney and children’s storybooks, like little else in gaming aside from Gala Bingo’s castle-themed bingo room. That game presents an idyllic (though cartoonish) castle on a hill and invites bingo players to become “king or queen of the castle” by way of winning games. Bouncy Kingdom essentially asks you to do the same thing in a different way (bouncing, not bingo), but the castles are oddly similar; it almost looks like Bouncy Kingdom is what takes place inside the bingo castle’s walls! It’s fitting enough, because again, this is a rare shout-out to cheesy castle graphics (which I mean in a good way). Then of course there are the characters to consider. You start as The King (odd, I thought, that you aren’t some sort of peasant at the beginning), and he’s animated by, as a review at Inside Games Latam put it, “next-gen ragdoll physics!” That means The King is essentially flopping around as carefree as can be while you bounce him off the walls, floors and ceiling, and it’s almost hard not to chuckle while you do it. But The King isn’t the only person you can control. Through a combination of game rewards and in-app purchasing, you can gain access to a whole cast of amusing characters: The Queen, The Knight, The Wizard, The Peasant (I knew there’d be a peasant! ), and even some strange ones like The Astronaut and The Yeti. Different characters even have different abilities within the bouncy castle. That pretty much says it all. A lighthearted, fun soundtrack adds a lot as well, as does the fact that the controls are as simple as tapping the screen to boost your bouncing character. But it’s really the castle atmosphere, the characters, and the gameplay itself that combine to make Bouncy Kingdom a surprise hit.